Yolk–shell Fe3O4@N-doped carbon nanochains, intended for application as a novel microwave-absorption material, have been constructed by a three-step method. Magnetic-field-induced distillation-precipitation polymerization was used to synthesize nanochains with a one-dimensional (1D) structure. Then, a polypyrrole shell was uniformly applied to the surface of the nanochains through oxidant-directed vapor-phase polymerization, and finally the pyrolysis process was completed. The obtained products were characterized by X-ray diffraction (XRD), X-ray photoelectron spectra (XPS), and thermogravimetric analyses (TGA) to confirm the compositions. The morphology and microstructure were observed using an optical microscope, scanning electron microscope (SEM), and transmission electron microscope (TEM). The N2 absorption–desorption isotherms indicate a Brunauer–Emmett–Teller (BET) specific surface area of 74 m2/g and a pore width of 5–30 nm. Investigations of the microwave absorption performance indicate that paraffin-based composites loaded with 20 wt.% yolk–shell Fe3O4@N-doped carbon nanochains possess a minimum reflection loss of −63.09 dB (11.91 GHz) and an effective absorption bandwidth of 5.34 GHz at a matching layer thickness of 3.1 mm. In addition, by tailoring the layer thicknesses, the effective absorption frequency bands can be made to cover most of the C, X, and Ku bands. By offering the advantages of stronger absorption, broad absorption bandwidth, low loading, thin layers, and intrinsic light weight, yolk–shell Fe3O4@N-doped carbon nanochains will be excellent candidates for practical application to microwave absorption. An analysis of the microwave absorption mechanism reveals that the excellent microwave absorption performance can be explained by the quarter-wavelength cancellation theory, good impedance matching, intense conductive loss, multiple reflections and scatterings, dielectric loss, magnetic loss, and microwave plasma loss. 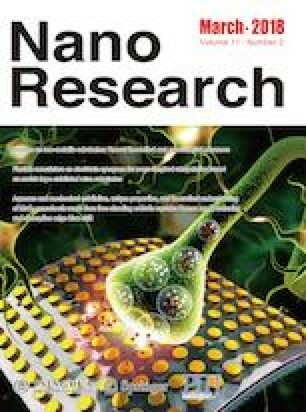 Supplementary material (synthetic process of Fe3O4 magnetic microspheres; the local enlargement of XRD pattern for Fe3O4@P(EGDMA-MAA)@PPy nanochains; XRD patterns of yolk—shell Fe3O4@N-doped carbon nanochains; reflection loss curves of paraffin-based composites with loading 10% weight fraction yolk—shell Fe3O4@N-doped carbon nanochains at different layer thicknesses; typical Cole-Cole semicircles of yolk—shell Fe3O4@N-doped carbon nanochains; eddy current curve of yolk—shell Fe3O4@N-doped carbon nanochains) is available in the online version of this article at https://doi.org/10.1007/s12274-017-1767-0. The authors are grateful for the financial support provided by the National Natural Science Foundation of China (Nos. 51433008 and 51673156).